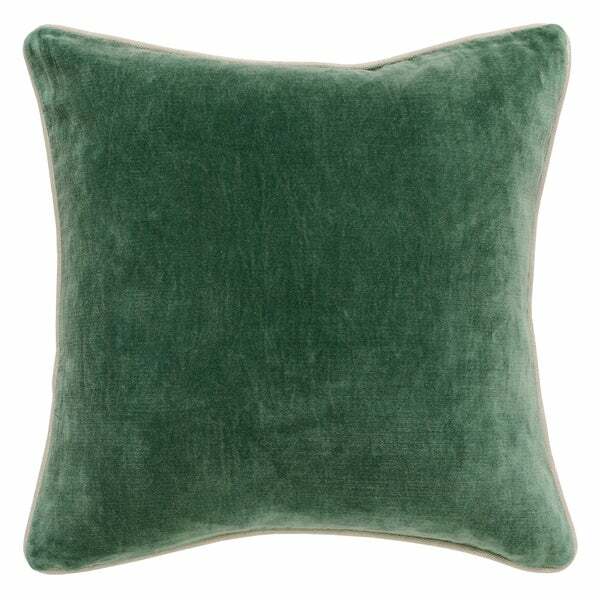 Transform any space with vibrant new colors with the Kosas Home Harriet 18-inch Hunter Green Cotton Velvet feather and down filled pillow. Antique stone washed with cotton herringbone piping these grandeur pillows showcase bold colors for an update to any space. Crafted from 100-percent velvet, these knife edge pillows are filled with a feather and down blend fill combining comfort and design into one beautiful pillow. These look great in our guest room... I was on the hunt for a soft green velvet pillow and these were just what we needed. The color is a blue-green, eau de nil as it were. Well stuffed and nice fabric. Cant beat the cost! The green color is as shown. However, what you cannot see in the photo is the piping color. The edge piping (welt) is tan. It contrasts the pillow color. These were the perfect jewel tone green velvet pillows. I thought the velvet would be a bit softer but they still look great. The beige piping detail adds a nice touch. Not clear in photos, but there is a contrast piping on the edge of the pillow that is a light silvery grey. This detail completely changes the look of the pillow and though they are nice was not what I was expecting. Beautifully made and very nice. Love these pillows and would highly recommend them. This is high quality, looks custom with the cording and is a nice soft pine green. Very happy.